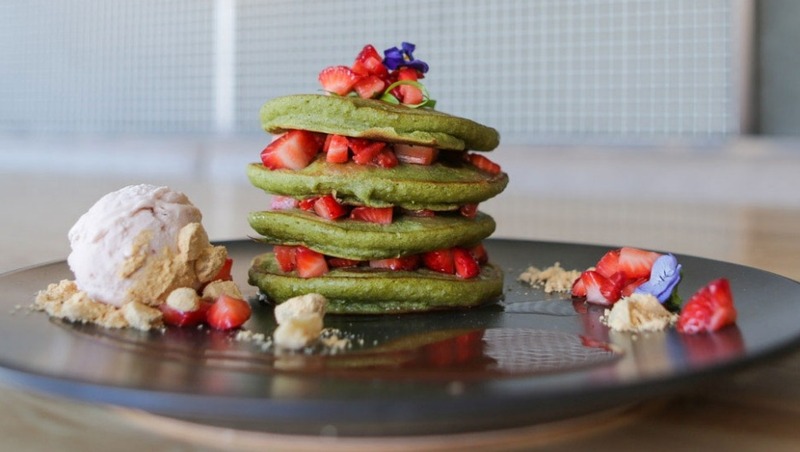 This is one of the signature dishes at Melbourne's Matcha Mylkbar, the brainchild of Nic Davidson and Sarah Holloway, the team behind leading matcha suppliers Matcha Maiden. Whisk together flour, sugar, matcha, salt and baking powder until aerated. Make a well in the dry ingredients and add oil, then slowly add water and whisk until smooth. Heat non-stick pan on medium heat. Using a ladle, pour a scoop of pancake mix into the pan. When air bubbles appear, flip over and cook for a further minute. Repeat with remaining mixture. Melt chocolate over double boiler. In a separate pot, bring the coconut milk to a simmer. Incorporate milk slowly into the melted chocolate. Once combined, stir in cacao powder and salt. Leave to cool. Make the pancake stack: Place one pancake on a plate, add some chocolate sauce and seasonal fruit, add another pancake, add some more chocolate sauce and seasonal fruit, and repeat (approximately four pancakes per serve). Pimp up with some ice-cream. Regret nothing.